The word and concept of "bonbonniere" comes fromFrench and literally means "sweet souvenir." In this country, it decided to give guests small bags or boxes with candy or other sweets. The tradition quickly became the wedding and spread throughout the world, and now Russian bride scratching their heads, how to surprise its guests. 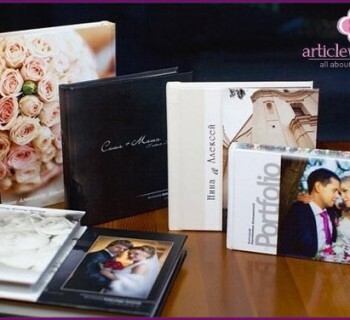 The best options will prompt wedding portal www.articlewedding.com. Candies. Save the wedding tradition and has treated guests just that little dessert. It may be drops, lollipops, candy zhvatelnye ... Be careful with chocolate - it can melt in the summer heat. It is better to look for candies individually wrapped and remember: take on, there should be an odd number. Nuts or sugar glaze. Sugar at high temperatures remain much better than the same chocolate. They prefer nuts almonds or hazelnuts. A sign about the number of works in this case. Tea. Buy several varieties of loose tea and packed in individual sachets - 30 grams per guest accurately. Jam. Perfect - a home, but will suit anyone, even jam. Lay out in small jars and close the lid on top and decorate with paper tape. Candles. 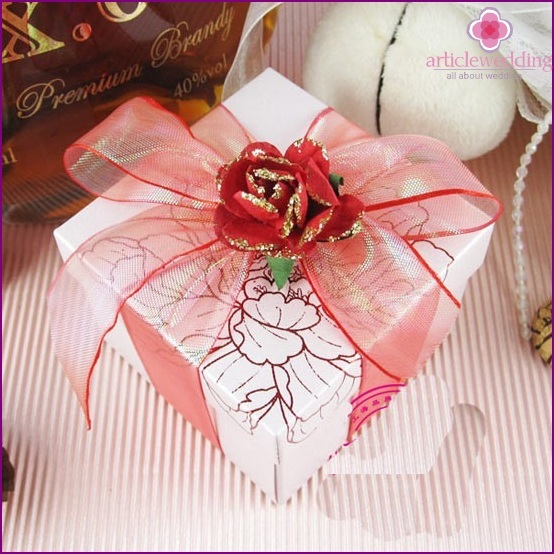 Buy a package of small fragrant candles - they create an atmosphere of warmth and comfort. Bell. The material can be completely different: on the metal is easy to do the engraving, and on clay just write their names and wedding date. Photo taken with a guest at the wedding. If you have a photo printer - grab it to a banquet, and let the wedding photographer will print images directly during the celebration. CD with music. Ask the DJ in advance to make copies of a playlist of your wedding. Be sure to include to sign songs, for example, under which you performed the first dance. Beautiful artwork with your photos, type in a special service. Boxes. They may be either classical square or irregular shape. 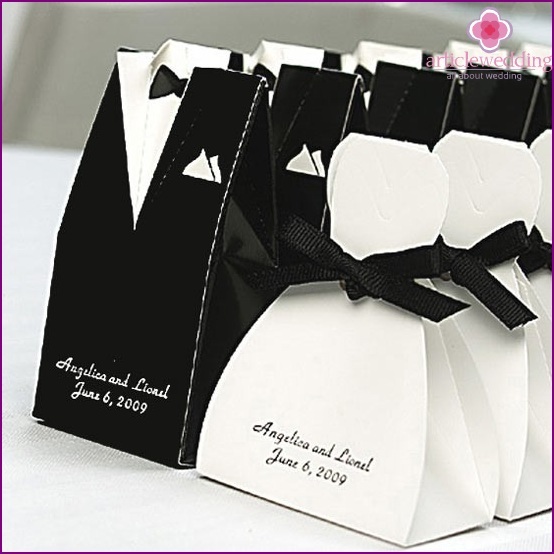 Very popular package in the form of the bride and groom costumes, casket, coach, heart and even the chair and watering can. The cloth. 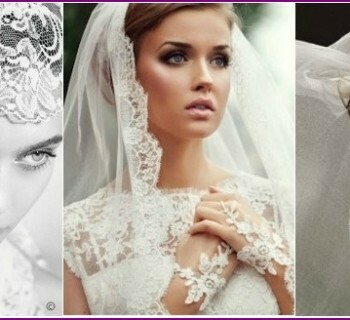 Standard used tulle - it always reminds veil of the bride, especially if you choose white color. 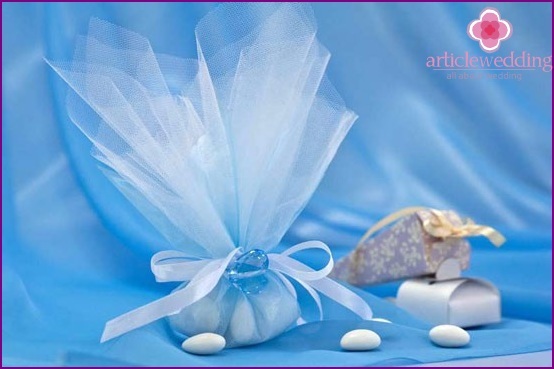 Our wedding portal www.articlewedding.com recommends this option because it is easy to make yourself. 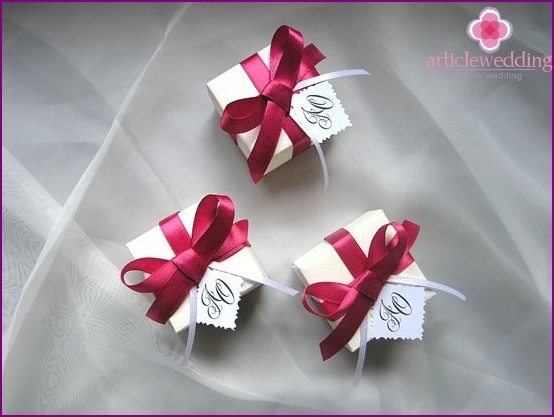 For this you will need to design a fabric and ribbon to match your celebration. From tulle cut squares of desired size, in the center, place your souvenir. Then, lift the edge so that they form a pouch and tie all the tape, make a beautiful bow. 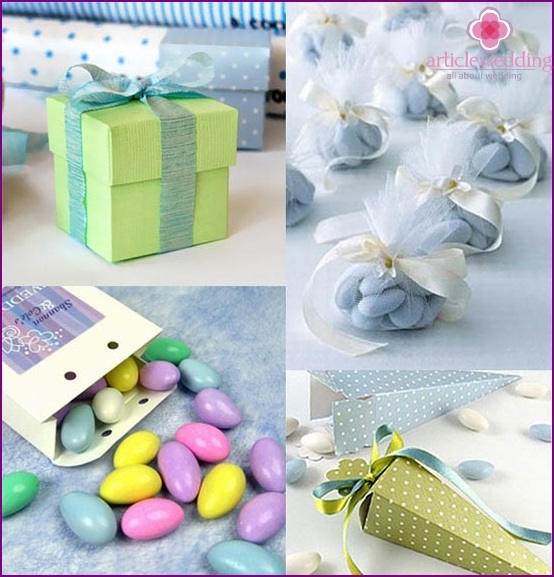 Fabric can be made in the form of packaging and candy - very beautiful and unusual. Plastic is commonly used for small pills - so they are more comfortable to sort and store. But while in Russia, few firms that can do such packages on request. So, you choose the content and appearancebonbonnieres ... It remains to decide how to present them. They can decorate the table serving: put them near devices per guest. 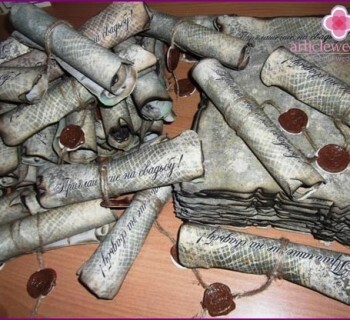 If you want to thank the guests personally, the ceremony of donation can make mutual. You can build the whole pyramid of sweet dishes, or just arrange them on a separate table, but remember, it's hard enough to keep track of whether each will get a souvenir (may be guests who not only grab your a present - especially for children). 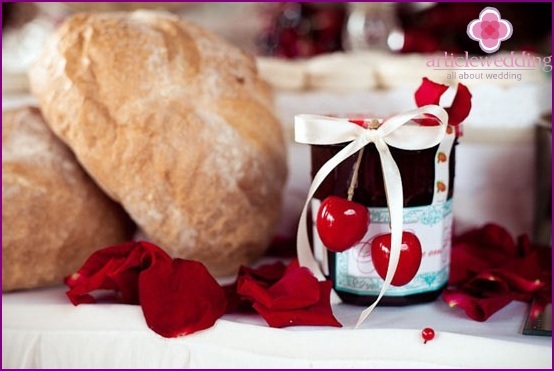 Bonbonniere - is a wonderful tradition that will lift your mood and guests will be a symbol of your appreciation.